Seven of the 10 richest sportswomen in the world during the past year, according to Forbes, were tennis players, with Maria Sharapova top of the list with earnings of $29m (£18.9m). The Russian’s endorsements of $23m dwarfed the $6m she collected in prize-money for a 12-month period ending in June of this year. Much of her income came from sportswear manufacturers Head and Nike, while the 26-year-old has also launched her own brand of sweets called Sugarpova. Second in the list of leading female earners was Serena Williams of the United States ($20.5m), followed by China’s Li Na ($18.2m) and Victoria Azarenka of Belarus ($15.7m). Other tennis players in the top 10 are Caroline Wozniacki ($13.6m), Agnieszka Radwanska ($7.4m) and Ana Ivanovic ($7m). The only three non-tennis players in the women’s top-10 are American Nascar driver Danica Patrick ($15m), South Korean figure skater Kim Yuna ($14m) and US golfer Paula Creamer ($5.5m). Sharapova earned more than male tennis counterparts Novak Djokovic ($26.9m) and Rafa Nadal ($26.4m). However, her yearly earnings were bettered by 21 men, with American golfer Tiger Woods the highest paid athlete on the planet with $78.1m of which $65m came from endorsements. Swiss tennis player Roger Federer ($71.5m) is second followed by American bastkeball player Kobe Bryant ($61.9m). Andy Murray was pushed to the limit by David Nalbandian before booking his place in the third round of the Rome Masters. The former Wimbledon runner-up bounced back from a nightmare start to push Murray hard in the decider but the British number one, celebrating his 25th birthday, eventually prevailed 6-1 4-6 7-5 win. There was no hint of the drama to follow when Murray, returning to action after missing last week’s event in Madrid with a back injury, swept through the first set and looked ready for a quick night. But Nalbandian battled back to level the match and went a break up in the decider before his frequent unforced errors began to tell and Murray clawed back to serve out for the match after two hours and 37 minutes. There were no signs in the first set of Murray’s stuttering start to the claycourt season, which apart from his back injury also saw him suffer a shock loss to Milos Raonic in the Barcelona Open last month. Murray broke Nalbandian twice to blaze into a 4-0 lead and after breaking the Argentinian for a third time the Scot served out to take the set, with Nalbandian complaining about glare from the setting sun. Nalbandian looked much stronger from the start of the second set, and both players found their form on serve with no break points for either until Murray served to stay in the set at 4-5 down and was broken. Murray had the first chance in the decider, fashioning two break points on the Nalbandian serve at 1-1, but the Argentinian hung on and went on to break Murray to seize the advantage. But Murray responded by breaking back immediately and grabbed the crucial second break at 5-5, when after spurning his first two of three break points, he only converted the third after the most fortunate of net cords. Nalbandian was not quite finished, going 15-40 up on his opponent’s serve as Murray served for the match, but a backhand drive which clipped the outside of the line helped Murray haul back to deuce before rounding off a gutsy win. Schiavonne’s slump continues in Rome. Francesca Schiavone was an early casualty in the Rome Masters today after losing her opening round match to Ekaterina Makarova. The out-of-form Schiavone, the 10th seed here and 2010 French Open champion, was beaten 6-3 6-4 by her Russian opponent as she slumped to a 10th defeat in her last 12 matches. Serbian Ana Ivanovic, the 13th seed, had no such concerns though in her 6-4 6-3 win over Russia’s Svetlana Kuznetsova in a battle between two other former Roland Garros winners. Other players making it through their opening matches today were Anastasia Pavlyuchenkova, Julia Goerges, Anabel Medina Garrigues, Christina McHale, Chanelle Scheepers, Iveta Benesova, Shahar Peer, Vania King and Sofia Arvidsson. Serena leaves no doubt about who’s the best! As if Williams’ 61 63 quarterfinal victory over World No.2 Maria Sharapova wasn’t impressive enough, her dismantling of Azarenka in the final was her 13th career win over a World No.1, tying Venus Williams for most victories over a World No.1 among active players; she also ties Kim Clijsters for second-most WTA titles among active players with 41 (Venus Williams has 43). Perhaps the biggest message: Williams is now 13-0 on clay this year, having gone 5-0 to win Charleston, 2-0 to help the US back into the World Group of Fed Cup, and now 6-0 to win Madrid. And along the way she has only lost one set, to Caroline Wozniacki in the third round this week (winning that, 16 63 62). “I absolutely love clay. I grew up on clay – I played on hardcourt until I was 11, then until I turned 16 I only played on clay courts,” Williams said. “I actually love the clay but my results haven’t been stellar. I have won the French Open and lots of clay court tournaments, though. It’s really a myth about me not liking clay. I like it more than grass, which is weird. Hopefully I can start doing better.” Williams is now 7-1 in her head-to-head series with Azarenka. With the title run, the former No.1 keeps her climb back up the rankings going, No.9 to No.6. A win by Federer is tomorrow’s final will vault him into the #2 position. Roger Federer will play Tomas Berdych in Sunday’s Mutua Madrid Open final. The Swiss will win this event for the third time if he sees off the Czech, having eased past Janko Tipsarevic. A 6-2 6-3 victory took Federer into his 104th career final, while Berdych edged out 10th seed Juan Martin del Potro 7-6 (7/5), 7-6 (7/6) in the other semi-final. Federer, a winner of this event in 2006 and 2009, has benefited from the early exits of both Rafael Nadal and top-ranked Novak Djokovic on the blue clay which has attracted criticism for being slippery. And he had few problems today, wrapping up victory in 67 minutes and hitting 25 winners and eight aces in the process. The Swiss excelled in his service games and took control of the first set in the fourth game when he broke Tipsarevic and wrapped up the set when he repeated the feat two games later. And the end was in sight for the man who knocked out Djokovic when he was broken in the fourth game of the second set, giving Federer the incentive he needed to close out the contest. Another success inthe final against sixth seed Berdych will see Federer replace Nadal at number two in the ATP Rankings. “In 2013, if they play on blue [clay], they can have their own tournament but I am not coming for sure,” says Djokovic! Djokovic was also critical of the ATP and says players must be consulted in future before new initiatives are introduced. “They made a decision without the players agreeing on it so this is a rule that has to be changed immediately,” he said. “The fault is from the people who gave them permission to do these things. This is just a clear example of how our system does not work in favour of players.” Djokovic was particularly critical of former ATP chief executive Adam Helfant, who took the decision to allow Madrid to switch to blue clay in order to make it easier for television viewers to follow the yellow balls. Earlier on Friday, Helfant said he gave Madrid the green light only after receiving assurances the blue courts would play the same as the traditional red surfaces. He said he consulted the players and tournament officials and, realising they could not agree, made the decision himself. Also on Friday, tournament chief Ion Tiriac apologised for the slippery courts but defended the colour switch, which he said had nothing to do with the problems with the court surface. Tiriac explained that the courts, which have to be built from scratch six weeks before the tournament, had been pressed too much, which meant the clay was unable to penetrate the hard base. “The players are right when they say it is too slippery and I apologise,” he said. Love her or hate her, but respect her for being the best player in the world, maybe the best ever! Serena Williams thrashed Maria Sharapova to reach the semi-finals of the Madrid Open. The American triumphed 6-1 6-3 to claim her 11th successive victory on clay. Sharapova a recent winner in Stuttgart, was again beset by problems with her serve. She produced eight double faults and was shown no mercy by Williams. The new blue clay on show in the Spanish capital is playing fast, something which would appear to aid Williams’ power game. She has already won on clay in Charleston this season – another venue known for its court speed – but whether Williams will be able to continue her impressive form on the slower courts of Rome and Roland Garros remains to be seen. Earlier in the day Victoria Azarenka fought back from a set down to reach the last four. The world number one found herself in trouble against reigning French Open champion Li Na but recovered to post a 3-6 6-3 6-3 success. Li started like a train and when she broke serve in the opening game of the second set, a shock looked on the cards. However, Azarenka retrieved the break immediately and pushed on in the second set to level the match. The momentum was well and truly with the Belarusian entering the decider and she duly raced 4-0 in front. Li found a second wind though, recovering to 4-3 and then threatened to break Azarenka again to level the set. However, Azarenka held her nerve, her serve and closed the match out in the following game. The top seed will next face Agnieszka Radwanska, a player she has beaten five times already this season. Czech qualifier Lucie Hradecka continued her shock run through the Mutua Madrid Open, following up her second round upset over reigning Wimbledon champion Petra Kvitova with a 76(8) 76(6) quarterfinal stunner over reigning US Open champion Sam Stosur, firing 19 aces in the process. Though she came into Madrid ranked No.105, Hradecka has seen much higher heights, having gone as high as No.41 in the world last summer. She brought out her best in her upset of World No.4 Kvitova earlier in the week, and she did it all over again against World No.5 Stosur, keeping the pressure on in a tight first set tie-break and closing it out on her fourth set point, then saving a set point in the second set tie-break. Neither player was broken in 24 service games. Hradecka’s wins against Kvitova and Stosur are her first two Top 10 wins, and the 26-year-old was already competing in her first ever Premier quarterfinal. Next up is Serena Williams. Fernando Verdasco inflicted Rafael Nadal’s first defeat of the clay-court season to dump the world number two out of the Madrid Masters. 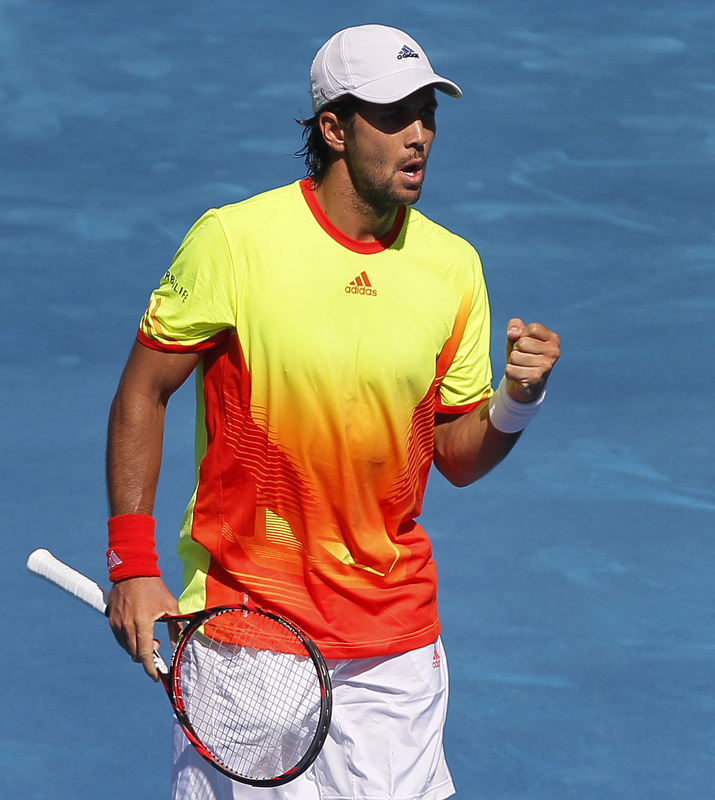 Verdasco, the 15th seed, had lost all of his previous 14 meetings with his Spanish compatriot. But the 28-year-old upset his Davis Cup team-mate 6-3 3-6 7-5 to book a quarter-final against Tomas Berdych. The Czech sixth seed eased through earlier on Thursday, winning 6-1 6-1 against Gael Monfils, seeded 12th. Nadal had previously won twice in Madrid and the six-time French Open champion was in good form having won a record eighth Monte Carlo title and a seventh Barcelona crown last month. The 25-year-old star took the third-round match to a deciding set but Verdasco, playing in his home city, prevailed to disrupt Nadal’s preparations for this year’s French Open, which begins later this month. Berdych had earlier ended Monfils’ comeback from injury. The Frenchman was playing for the first time since picking up an abdominal muscle problem in March and failed to earn a break point. There was another surprise in the men’s draw as Ukraine’s Alexandr Dolgopolov knocked out fourth seed Jo-Wilfried Tsonga of France. Dolgopolov, seeded 16th, won 7-5 3-6 7-6 (7-2) to book a last-eight match with Argentina’s Juan Martin del Potro, the 10th seed disposing of Croatian Marin Cilic 6-2 6-4. Federer survives a scare from Milos Raonic. Federer, who hasn’t been eliminated from a tournament in the second round since the 2010 Rome Masters, will face France’s Richard Gasquet in the third round. Rafael Nadal had an easier time in his first match on the blue clay as he beat Nikolay Davydenko 6-2, 6-2.